Marbella Going Dutch with Dario Poli – The Euro Weekly News | Marbella Marbella – Adelante! 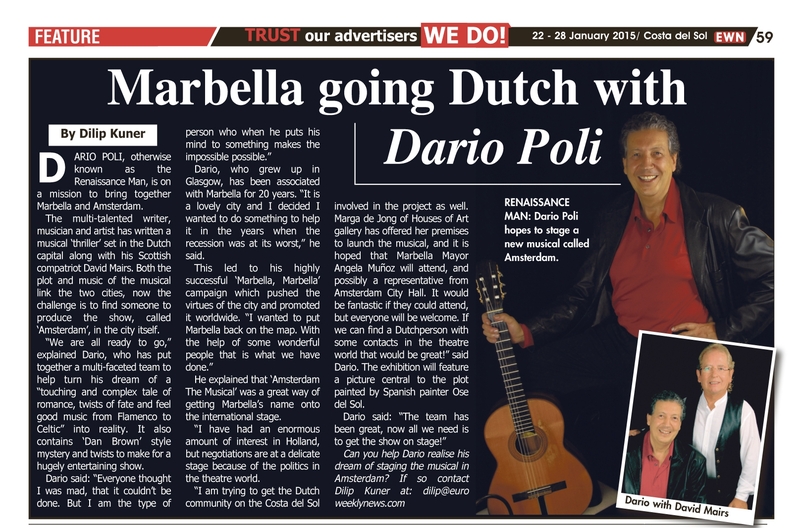 On behalf of all the team working on producing “Amsterdam the Musical” with a story that links two well- known but very different cities Marbella and Amsterdam, we would like to take this opportunity to thank the enterprising Euro Weekly News and its positive owners Michel and Steven Eusden, for helping to support our latest intiative once again, and for their past support during the difficult days of the Marbella campaign that I conceived some years ago, and whose help, freely given by them, was essential during those negative times for Marbella. Amsterdam the Musical is an original work created by David Mairs and I, and is a light hearted, enjoyable and positive fun show, that has evolved from the Marbella campaign and relects Marbella’s restored confidence and takes us into a new dimension in a different but more complex art form, that reflects the new positivity and success for Marbella and the Costa del Sol in general. Dario Poli .